The B-17 Flying Fortress is a four-engine heavy bomber aircraft developed by Boeing for the United States Army Air Corps. It was a high-flying, long-range bomber, heavily used in World War II for daylight precision bombing of strategic military targets. It was highly effective and reliable, and developed a reputation of being able to return to its home base despite extensive battle damage.The B-17 Nine-O-Nine was named after the last three digits of her serial number: 42-31909, and is representative of the B-17's tough reputation. After joining the war in 1944, the Nine-O-Nine completed 132 consecutive missions without aborting for mechanical reasons or loss of crew, believed to be a record. In all she flew 1,129 hours and dropped 562,000 pounds of bombs before returning to the US at the end of hostilities.The Collings Foundation currently operates a fully restored and operational B-17G in "Nine-O-Nine" colors, in honor of the veterans of the World War II. It is one of the finest B-17 restorations ever done and can be seen at the Wings of Freedom airshow that visits 120 cities nationwide. 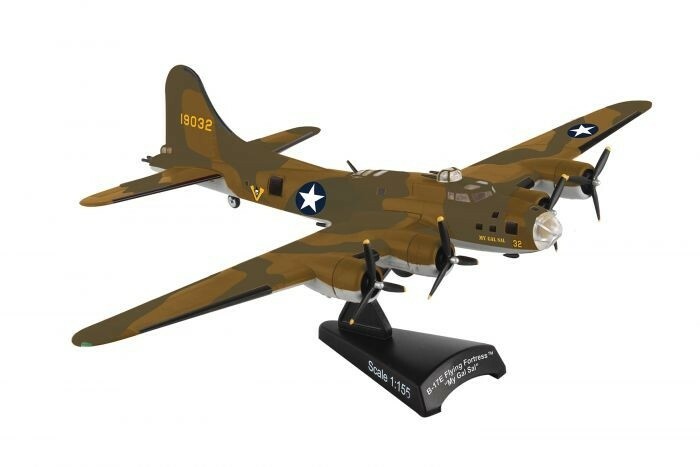 This Die-cast metal airplane model comes in 1:155 scale with plastic stand and is approximately 5 3/4 inches long with 8 inch wingspan.